I didn’t watch the U.S. Vice-Presidential debate this week, but from what I understand from the news coverage, Joe Biden was laughing, a lot. I have no idea why he was laughing; I guess government manipulation of the economy is funny. Excessive government isn’t just an American disease; it’s a world-wide phenomenon. Venezuela re-elected Hugo Chavez this week. What’s up with that? Abject poverty, and yet the people love him? Or it was all a fix? The Nobel Peace Prize goes to the European Union? A quasi-government organization that has squandered Europe’s past on more bureaucracy for the future? No wonder Joe is laughing. Gold down 1.25% (although still up 12.16% on the year). Does the negative action last week imply that we are at the start of a prolonged downturn? Hardly. We are in a manipulated economy, and the election is a few weeks away. 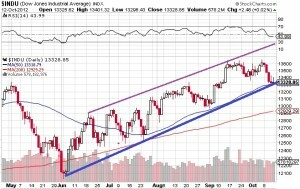 Now would be the perfect time for the market to go on one final upswing. Just as we had an amazing jobs report a week ago, bringing the unemployment level under the magic 8% mark, a new high on the Dow is not out of the question. Expect continued strength over the next few weeks. Of course after the first week of November a big crash is not out of the question, but that’s a few weeks away. Gold also appears to be be building a base, so I have no concerns about that investment for the future. Beyond that, I have nothing of note to add to the discussion, so we sit, and watch the laughing.